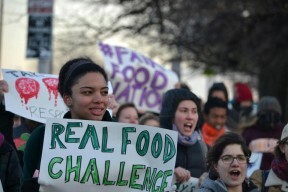 This week, Jewish Organizing Fellowship alumni, David Schwartz and Nina Mukherji recorded a significant victory in their organization’s (Real Food Challenge) on-going campaign to bring sustainable and ethical food purchasing to America’s college campuses. Amidst growing demands from college students for university leadership in sustainable food systems, Real Food Challenge and Sodexo(one of the world’s largest food service companies) jointly announced an agreement that advances supply chain transparency on Sodexo-contracted campuses. This announcement comes after years of on-the-ground student organizing and months of discussion with the company’s leadership. The agreement cements a commitment by Sodexo to universally honor student requests for food chain transparency on their 500+ campuses–including sharing a complete record of farms and food vendors they work with–and making public the results of student-driven Real Food Calculator assessments. Read more about what this means for transparency in the institutional food service industry at realfoodchallenge.org. This entry was posted in Alumni At Large, Fellowship, From the Field, Our News, Success Stories and tagged Alumni, College Campuses, David Scwartz, Ethical Food, Fellowship, Nina Mukherji, Real Food Challenge, Student Organizing. Bookmark the permalink.